Today (Day 3) the 2015 World Series of Poker money bubble will burst. For the last several years that moment has come during Day 4, usually late in the afternoon, although I’m recalling one memorable instance in 2010 when they were four off the money and went to dinner break, stretching out the suspense an extra hour-and-a-half. After initially announcing just before Christmas a plan to repeat last year’s Main Event payout schedule and guarantee $10 million for the winner, there was a lot of less than enthusiastic response over Twitter, prompting the WSOP to do a survey and then change their plans in late January. The new schedule jettisoned the $10 milly guarantee in favor of accepting two different ideas proposed by players -- guaranteeing each of the nine players who make the final table at least $1 million, and also paying the top 1,000 finishers. Both of those ideas came with conditions, which then were restated in the structure sheet for the Main Event. The other condition stated “This event will payout 1,000 places and pay a minimum payout of $15,000 if the event reaches a minimum of 5,000 players.” They got there easily enough, and indeed the schedule does call for those finishing 649th-1,000th to earn exactly $15,000. In fact, the payouts ended up very closely following what my friend Darrel Plant surmised was going to be the case in a table he created for PokerNews back in late January in which he estimated what they would be by looking at last year’s turnout. There has been a lot of positive reaction to the idea of paying 1,000 players, even if over a third of them are only going to get 1.5 times their buy-ins, and less than half will double their money. And I think when we get to Monday and Tuesday -- the last days of play this summer -- there will again be some added excitement when that “November Nine” bubble arrives and players are eyeing the seven-figure score awaiting those who make it to the final table. Paying a little under 15.6% of the field is not so far out of the norm for tournament poker to be that strange, I think. And there will no doubt be a lot of happy stories surrounding those realizing the achievement of cashing in the Main Event today, which will be fun to follow. 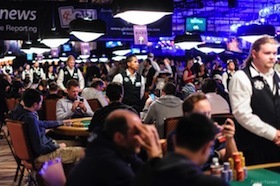 Thinking back to how the WSOP Main Event began as a winner-take-all affair. From 1971 (the first year they held a tournament) through 1977, only one player made the money. It wasn’t until 2004 that more than a thousand actually played the event (the post-Moneymaker year the turnout jumped from 839 to 2,576). Now a thousand players are actually getting a piece of the prize pool. And I’m going to guess they’ll keep this payout schedule in place at least for the near future, too.